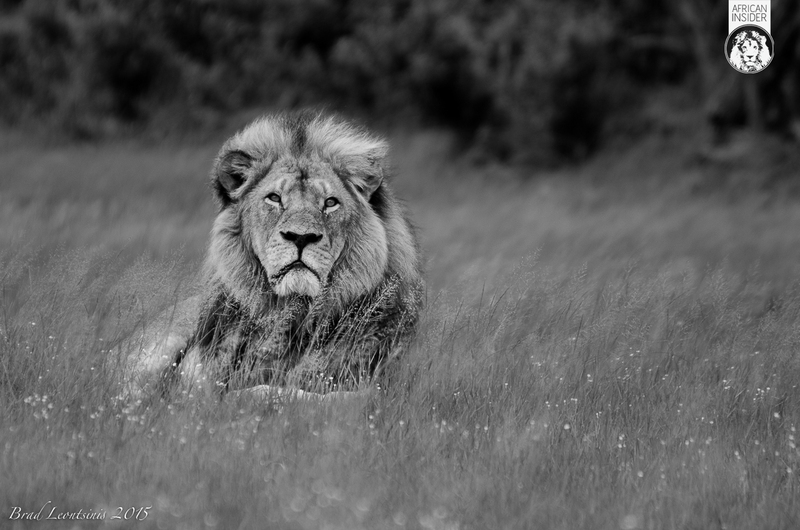 The death of Cecil the lion shone a spotlight on the dark industry of hunting. Never has there been a more critical time for awareness and action in the conservation of wildlife. Over the course of the last year, sad events have resulted in a previously unprecedented level of public awareness and outcry for the natural world. Walter Palmer, shot dead Cecil the lion in July 2015, an iconic animal in Zimbabwe, who attracted countless tourists. Attention was immediately drawn to the atrocities of the dark industry of hunting, blanketed in a shroud of mystery with consistent conservation claims justifying the actions of the unimaginable. Some forms of hunting can assist conservation but it is a sad reality that the majority of the hunting industry hides behind unwarranted conservation claims. With the exposure of these types of incidents, which normally occur unabated, it is crucially important that the hunting industry is reformed and is held accountable for their actions. Wildlife cannot afford to play victim to the constant onslaught of human greed. The well-documented decline of ecological areas and animal numbers in a very short time is staggering. It is important to recognise where hunting can be utilised to the benefit of the ultimate victory, which is the sustainable preservation of wildlife and diversity. However, this cannot be done until full transparency of the hunting industry is achieved, with accountability. With the rise of photographic tourism and dedicated, passionate amateur photographers, there has never been a time like now for conservation through photography to lead the way. As conservationists we have failed to make an important distinction between the elements of hunting which assist our cause and those which destroy it at its core. Few people understand the complicated nature of any value which hunting adds to wildlife conservation and equally the spine tingling damage which it causes. It is a difficult thing to gauge but is of critical importance. This has resulted in a divided public opinion and allowed for dark elements of the hunting industry to thrive unabated. An emotional debate rages while wildlife continues to suffer and the numbers decline at an unacceptable rate. Clearly the system is not working in it’s current form. 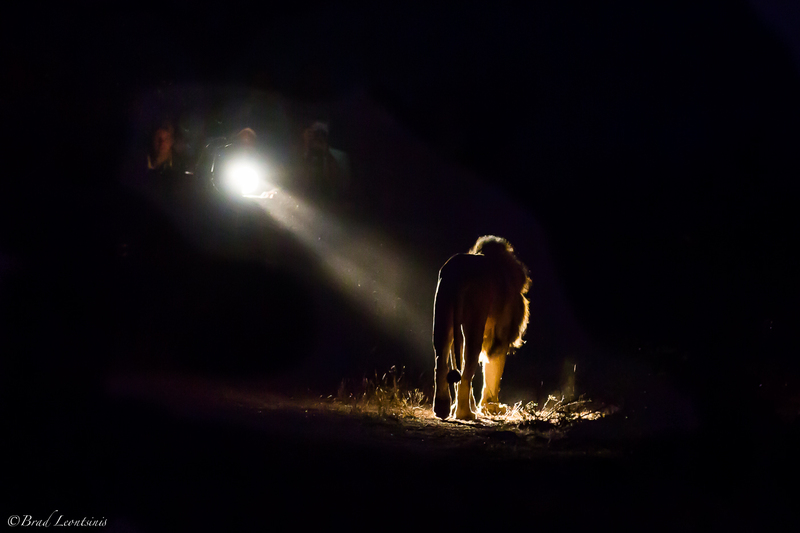 Both the Sydney Morning Herald and National Geographic have recently had conversations with Dr Craig Packer, who headed up the Serengeti lion project since 1978. In 2014 he was banned from entering Tanzania for speaking out against corruption in the governments wildlife sector and encouraging reform within the hunting industry. Packer identifies a handful of focused sites in Southern Africa where hunting has worked. Successful safari tourism typically requires areas to have abundant wildlife with picturesque landscapes and good infrastructure. Marginal areas, which cannot support successful photographic tourism in large enough numbers, can often support sport hunting instead. By giving the wild animals a value, these areas are reserved for wildlife as opposed to being used for agriculture or cattle farming. This cannot continue if there is any reasonable expectation of conservation success. A victory condition or common goal, recognised by both sides must be set. This means, strict conditions with clear and distinct pathways to conservation success are required for every bullet fired from the barrel of a rifle. The prospect should excite those elements of the hunting industry with genuine conservation intentions. With clear distinction, a strategy of enforcement and global policing must follow. “We need to get the international community to help shoulder the burden of what are, after all, World Heritage sites,” Packer says. In July 2015 Cecil the Lion, brought the plight of these big cats into the publics view not a moment to soon. The awareness, which the unworthy death of Cecil has created, is proving a powerful weapon in the conservation arsenal. This awareness must be refined into constructive conversations and strategies moving forward. 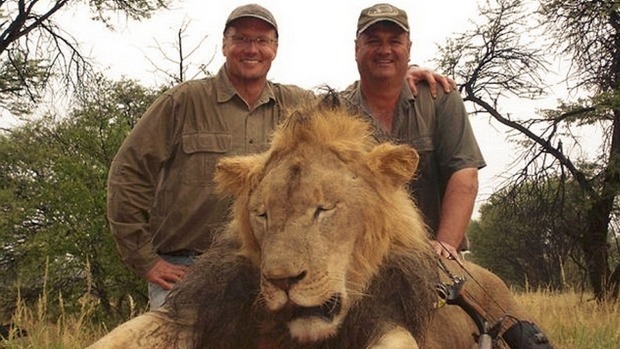 Walter Palmer and the hunting operator posing with the lifeless body of Cecil. A savage industry, in which countless numbers of lions are bred, farmed and caged in unacceptable conditions in wait of their slaughter. Foreign tourists are commissioned for thousands of dollars to face a sedated lion in a small cage in the recreation of a “wild hunt”. Supported by the South African government with the dangerous agenda of Lion Bone trade with the Asian market, lions are under severe threat of becoming nothing more than a commodity for human entertainment and consumption rather than the critical apex predator, which they are. Shortly after the death of Cecil the largest elephant was shot in over 30 years with the heaviest tusks recorded in living memory at the hands of a German hunter, also in Zimbabwe. The elephant was estimated to be in his mid forties and with at least 20 years of life remaining (elephants typically live into their mid sixties and only begin breeding in their forties) one can only imagine how massive this bull and his tusks would have grown. The hunting industry showed a middle finger to wildlife and conservation when this incident occurred within months of Cecil’s death. It is hard to justify one person having the right to kill one of the largest and most impressive animals, which remain in the world today. A permit of the same value could have been sold for any elephant hunt. I am not sure the world can or should ever accept that one person has the right to kill such a magnificent animal. The genetics of the great tusker elephants have all been savagely torn from today’s populations. What gives one person the right to rob the world of one of the last giant tuskers in living memory? His genes are gone. 20 years of breeding potential have been destroyed. Is it not for the hunting industry to be held accountable for such tragedies? Largest elephant in 30 years shot. As a wildlife and photographic guide myself, I know that not everyone can afford the hefty price tag which comes with touring the great wildlife destinations of the world. With successful models proven, marginal wildlife areas can be transformed into productive ones, as was the case with both Pilanesberg National Park and Madikwe Game Reserve in South Africa. Madikwe was once a cattle farm and has been re-established as one of the top private reserves within South Africa, generating millions in revenue towards the GDP every year. For the period of re-establishment, hunting can be utilised to support marginal land with a gradual hand over to the far more productive photographic tourism as the area becomes more sustainable and productive. If a model is created in this way, hunting will truly be working towards the conservation goal of increased land and space for wildlife. Derek Joubert’s model in the Selinda Conservancy of Botswana is proof of this. Over the past seven years his team has transformed the former hunting concession into an upmarket private reserve with luxury camps. Wildlife populations have thrived since the take over. The surrounding community and Botswana are receiving 2500 percent more revenue then they were with hunting. “Show me a piece of hunting land and give me the balance sheet of what it really earns for that nation (not just the hunting company), and I will present a more viable economic model,” Says Derek Joubert. In productive wildlife areas there is no need for hunting. This is where the hunting industry is most masterful in it’s deception. Safari tourism far out weighs the benefit to communities and the economy compared with hunting, yet hunting lodges thrive in the most prominent wildlife areas of today. Currently, many hunting lodges exist on the outskirts of productive wilderness areas like Hwange, as happened with the death of Cecil. These have no possible benefit to conservation in areas where established wildlife strongholds already thrive. They only force the removal of crucial genes from the population by shooting out viable competitors, which keep the genetics of the population strong. The photographing of an animal is sustainable, while the shooting of an animal ends the economic potential of that animal at it’s death. An area, which can support one hunting lodge can support far more photographic safari lodges resulting in more jobs and benefit to surrounding communities. Wildlife belongs to no person or collection of people, we are a part of the same world in which wildlife exists. It cannot be left to poor governments rife with corruption to come up with real solutions to the wildlife crisis when these governments cannot feed their populations. The allure of the might dollar is too great for mindful conservation and sustainable hunting models to be effectively enforced. It seems high time that we stop relying on wildlife to pay its own way and start to recognise that we are all better off for the fact that wildlife exists. Wildlife conservation is the responsibility of the entire world and should not just be the expectation of poor governments and desperate local communities. The death of Cecil the lion has signified a distinct shift in the how the world views hunting and the demise of our natural heritage. The world over there have been bans and restrictions on the number of trophies being imported. Most prominent airlines have announced they will not transport hunting trophies. A reform of the hunting industry is paramount if we are to succeed in the critical issue of conservation which currently is a battle being lost on all fronts. This is the mindful way of the future generations and with this type of support meaningful change can and must be made. 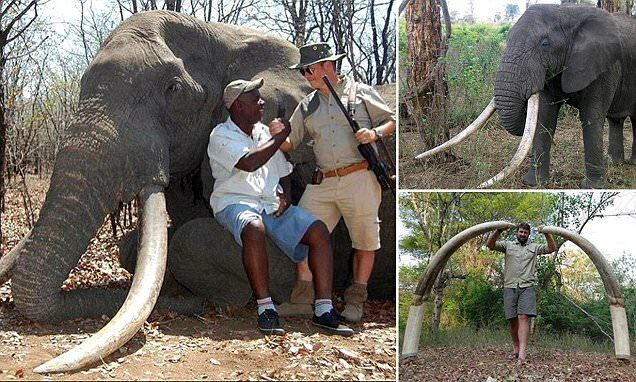 This is the legacy of the King of Hwange, Cecil the lion.